5000m. New WR is the second album of Greek conceptualist as11. 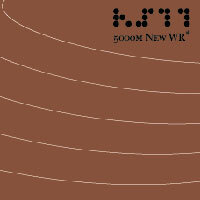 After last year's debut album "00:00" where he documented the change from the year 1999 to the year 2000 on a round- the-globe collage, on 5000m new WR, as11 simulates an one-man 5000m. race. Just the man against the clock. A sonic race with a frenetic rhythm in order to brake the world record for the distance established by Ethiopia´s Haile Gebereselassie clocking at 12'39"36. An amateur long distance runner himself, as11 exhibits his ability in constructing organized atmospheres with his particular view of the duality agony-tranquility. recorded and mixed at studio Tallers, Barcelona.